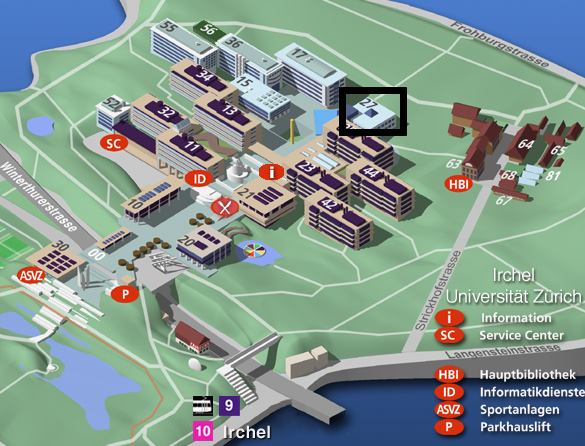 We are located in Building 27 (Office: Y27 J 54) at the Irchel Campus of the University of Zurich, which is a glass-enclosed cube at the south-east and of the campus. Below are maps of the campus area, as well as directions to the campus. By train and public transport. All inter-city connections bring you to the Zürich main station ('Hauptbahnhof') of the swiss federal railways ('Schweizerische Bundesbahnen SBB'). 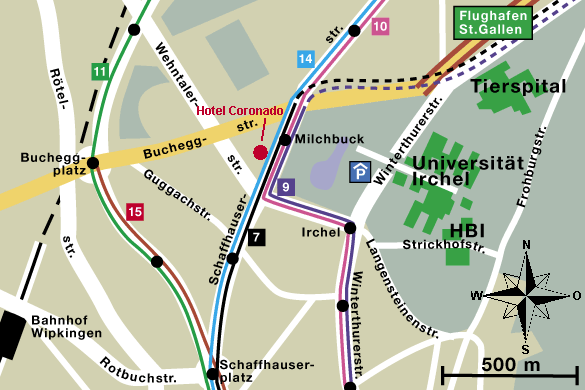 At the Zurich train main station you can take the following trams to the Irchel-campus. from Bahnhofplatz/HB take tram number 10 towards Seebach to the stop "Universität Irchel" (about 13 min). from Bahnhofquai/HB take tram number 14 towards Seebach to the stop "Milchbuck" (about 11 min). From there walk through the Irchel-parc to the Irchel-campus. from Bahnhofstrasse/HB take tram number 7 towards Stettbach to the stop "Milchbuck" (about 12 min). From there walk through the Irchel-parc to the Irchel-campus. Both stops are on the border of the campus park. Signs show the way to the buildings. From 'Universität Irchel' you have a slightly shorter walk than from 'Milchbuck'. Purchase a ticket for "Zone 110". A return ticket is valid for 24 hours and costs less than two single rides. Note that you have to buy your tram ticket at the tram stop or at the train station. No tickets are sold inside the tram. From the airport, you can take a taxi (about 35 CHF, about 15 min) to 'Universitat Zurich Irchel'. You will be dropped at the taxi pick-up, an underground parking place. Enter the door and take the elevator to the top floor, H (The floors are denoted by letters). From this floor, you can go outside and look for building 27. You can also take public transport, which is efficient and much cheaper. From the airport, take tram number 10 in the direction of 'Hauptbahnhof'. Get off at the tram stop 'Universität Irchel'. Note that you have to buy your tram ticket directly at the tram stop or in the train station inside the airport. No tickets are sold inside the tram. Follow the motorway N3 until the end. Then following the signs towards Winterthur, St.Gallen and Flughafen Kloten. You will cross the Limmat River on the Escher Wyss Bridge and go straight up the hill to the top. There you should see a sign directing you to the right to "Uni Irchel - Parkhaus", the campus underground parking lot, where you can leave your car. Do not go into Zurich. Instead follow the north branch of the motorway towards Winterthur and St.Gallen. At the "Dreieck Zurich-Ost" take the branch towards "Zurich, Chur, Luzern" , leave the motorway at the "Zurich-Schwamendingen" exit and follow the white signs towards "Irchel" until you see a sign pointing towards "Irchel - Parkhaus", where you can park your car. These directions also apply if you come by rental car from Zurich-Kloten airport. At the "Dreieck Zurich-Ost" take the branch towards "Zurich, Chur, Luzern". Leave the motorway at the "Zurich-Schwamendingen" exit and proceed as described above.